This past weekend I was fortunate enough to stumble across a local store that grinds their own wheat flour. The sign above the flour said “yes, it really does taste better”, and I couldn’t agree more. I am not a huge fan of whole wheat flour, because most time I find it to be a bit bitter in flavor. This flour however, was sweet and had a wonderfully nutty aroma to it. I decided I would try to make a bread with it that has a crispy/chewy crust with a wide open irregular interior crumb. The result was almost exactly what I was hoping for, and by my second attempt I felt I had what I was looking for. So, if you can get freshly ground wheat flour I would highly recommend it. Now, I am thinking I might need to ask for a grain mill for Christmas. Replenish your levain the night before with 130 grams (4.6 oz, little over ½ cup) water and 130 grams flour (4.5 oz, 1 cup). Measure out your ingredients into a large bowl, mix thoroughly, cover with plastic wrap, and allow to rest or autolyze for about 20-30 minutes. Remove the dough to an unfloured countertop and knead by hand for 7-10 minutes or until it passes the windowpane test. Lightly spray your bowl with cooking spray and place your dough ball back into the bowl and cover tightly with plastic wrap. Allow the dough to rise for about 1 hour then do a business letter turn on the dough. Place back in the bowl and do one more turn after an additional 30 minutes. Allow to rise until almost doubled in size. This will probably take an additional 45-60 minutes depending on the strength of your levain. On a very lightly floured countertop, divide your dough into 2 pieces. Shape each piece into a ball, cover with plastic wrap and allow the pre-shaped loaves to rest for 10 minutes. This will allow the gluten to relax and make shaping them easier. Gently press each ball into a rough rectangle. With the short side facing you, fold the top third of the dough down towards you to the middle, press the edge to seal. Then fold the bottom third up to the middle and seal the edge. Fold the dough in half and seal the bottom edge. Then gently rock the log back and forth to elongate it slightly. Proof your loaves in a floured couche or between folds of parchment paper for about 45-60 minutes. Preheat your oven to 500 degrees with a baking stone near the middle rack and an old cast iron skillet on the bottom shelf. 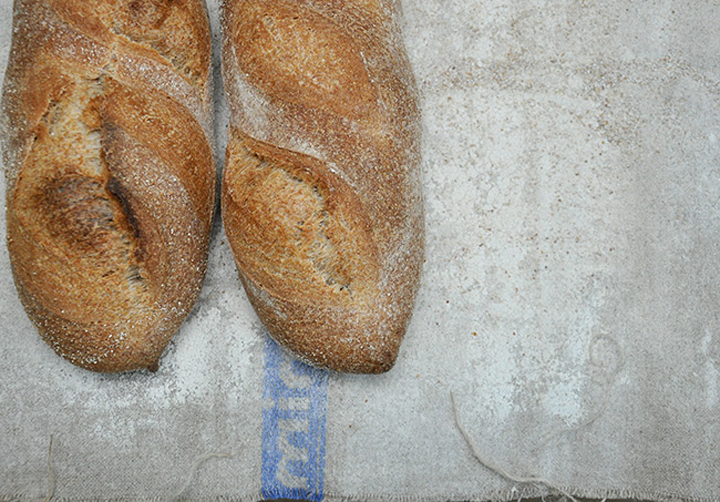 Transfer your risen batards with a flipping board or by hand to a lightly floured piece of parchment paper that has been placed on top of an inverted baking sheet or a baker’s peel. Cut two diagonal slashes slightly overlapping on each batard with a lame or single edged razor. Transfer the loaves on the parchment directly to the stone. Quickly add ½ cup of water to the skillet and reduce the oven temperature to 450 degrees. Bake for 20 minutes then reduce the temperature to 400 and bake for an additional 10 minutes, or until the crust is a rich brown. Turn the oven off and prop the door open slightly with a wooden spoon and allow the loaves to remain in the cooling oven for another 10 minutes or so. This will make it so that the crust remains firm even after it is cool. Allow to cool completely on a rack before serving.